[William Toye, author. Eugene Benson, editor. Canada’s 150th anniversary is coming up next year and there will be a lot of anniversary style looking back and looking forward. I just heard that our government will give us free admission to our national parks in 2017. What a great idea, to remind Canadians, who are mostly urban now, of our wildernesses. 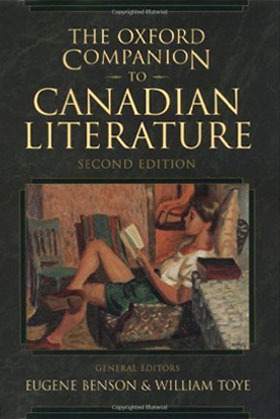 Next year will also mark the twentieth anniversary of the second edition of our Oxford Companion to Canadian Literature (1997) under the superb editorship of Eugene Benson and William Toye. The first edition was published in 1983, edited by William Toye alone. This edition was preceded by the Oxford Companion to Canadian History and Literature (1967) edited by Norah Story. In the past fifty years, our literary stewards have done what our National Parks stewards began in 1885. They put a few boundaries around what was there, named things and companionably suggested new ways for us to enjoy our literary explorations. I like the word companion. I think of the people (and dogs) that I’ve spent time with, traveled with. Companions share our experiences and expand the way we think. A companion to literature complements the books we love. It also tells us a lot about the categories in which we organize the world. This is why I find them fascinating. We would expect any Oxford Companion to Literature to include categories about Novels and Poetry and Essays. But a companion to Canadian literature creates distinct categories that tell us how we perceive ourselves.